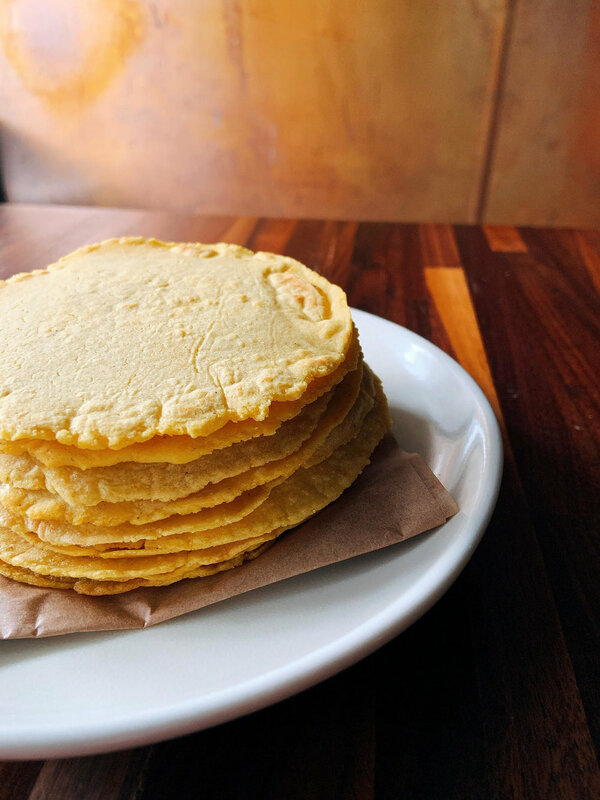 Continually striving for taco greatness, our Mission 18th Street San Francisco Tour partner Tacolicious is now hand-pressing non-GMO, organic corn tortillas on the daily at all of its locations. Beginning in 2009, Tacolicious relied on the pretty terrific tortillas hot off the presses from another Edible Excursions partner, neighborhood staple La Palma, a regular stop on our Mission 24th Street Tour. Up until about a year ago, La Palma machine made more than 7 million tortillas a year for the Tacolicious Gang of Five (locations in the Mission, Marina, North Beach, Palo Alto, and San Jose). The family-run and beloved Mexicatessen in the Mission sells much more than tortillas (everything from chilies, queso fresco, fresh masa, and prepared foods). The high volume demand for Tacolicious tortillas began to be a burden on La Parma’s production abilities, says Sara, who adds she would be honored to work with the business again in the future. In the name of research, Sara and restaurateur/chef Joe Hargrave, her partner in life and work, have traveled and tasted near and far in their search for what makes a terrific taco. They’ve eaten their way down tortilla-packed Highway 99 in California for a story for Saveur. They’ve slurped stewy tacos de guisado in Mexico City, as featured on Taste, and they’ve hung out in Sayulita eating street tacos al pastor, as captured on the Tacolicious restaurant blog. And this month the restaurant owners announced the pending debut of its first Southern California location. Joe, Sara & their crew are bringing the Tacolicious brand to Manhattan Beach. While the soul of a Mexican restaurant may be found in its salsa, its heart—according to our friends at Tacolicious—must be in its tortillas. A warm, fresh, chewy, yellow corn tortilla is the perfect carrying case for a taco’s tasty contents. And hand-pressed tortillas can’t be beat for their crinkly-edged aesthetic appeal, suppleness, fragrance, and delicacy. Agreed?